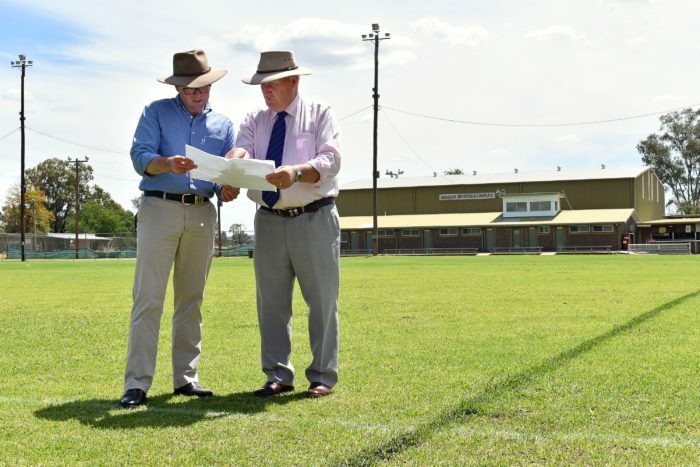 Northern Tablelands MP Adam Marshall, left, and Gwydir Shire Councillor David Coulton at the Warialda Recreation Ground looking over the upgrade plans. PLAYERS and spectators will soon enjoy much improved facilities at the Warialda Recreation Ground, after Northern Tablelands MP Adam Marshall today announced a $145,462 grant from the State Government to give the sports ground a major overhaul. Mr Marshall said the funding would help build a new structure that will give the ground new covered function areas and spectator space. “This is the major sporting field in Warialda and this project is the largest upgrade of the facilities for decades,” Mr Marshall said. Gwydir Shire Councillor David Coulton said the works would involve the demolition of two structures at the ground, with an old brick building and an outdated timber one go to make way for a new addition. “We will be able to provide a new bar area, update the kitchen, barbecue and dining area and function place between the buildings that will be undercover and an awning over the front will provide a better place for spectators and other users,” Cr Coulton said. Mr Marshall said the recreation ground was used by a variety of users, from the local rugby league club, touch footy and league tag, but also concerts and off-road and Honey Festival groups. “The ground is used regularly by the community and it sits right beside the Warialda Showground and near Captain Cook and is an overflow venue for some of the functions and events at those locations,” Mr Marshall said. Cr Coulton said the funding was a major win for locals. “The grant will pretty much achieve all we want to do, there hasn’t been much done at the ground for a long time, so this is just a big step up and a great assistance for the community,” Cr Coulton said.